Veasna in the Kitchen doesn’t offer your average Cambodian food experience. Our private dining experiences are the perfect opportunity to treat your taste buds to the true flavours of Cambodia. Or, if you’d like a more ‘hands-on’ experience, we offer a cooking class and food tour where you can learn to prepare simple, healthy Khmer dishes that are most importantly, delicious! Update 2019 – We are currently no longer operating all year round in Cambodia while we setup Cambodian Food Experiences in Dublin, Ireland. We will be back in Cambodia for some exclusive cooking classes and dining experiences during the busy season, updates to follow. In the meanwhile if you are looking for a Phnom Penh Food Tour we highly recommend checking our friends at phnompenhfoodtours.com. If you’d like to try Veasna’s Cambodian food in Dublin, Ireland please contact us for more info or see our eatwith page. We can also setup cooking classes by request. Cooking classes and dining experiences are typically held in our spacious, air-conditioned apartment overlooking the Tonle Sap River in the center of Phnom Penh. We want you to feel like you’re visiting friends, not going on a tour. Or, if you have a special venue in mind, we can come to you. 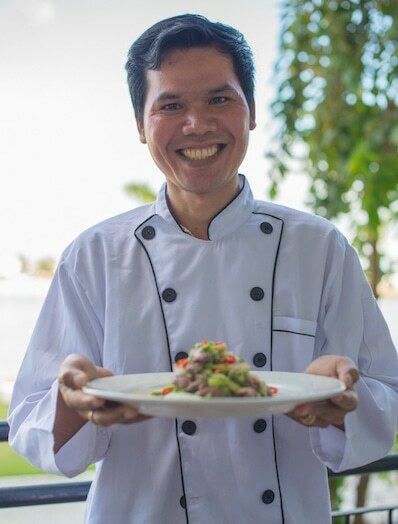 Veasna is a trained, professional Khmer chef with a passion for great food, and for sharing that food with visitors to Cambodia. This is your chance to have dinner cooked by a skilled chef, specifically tailored to meet your tastes. We are family friendly and very happy to cater to groups with children. You won’t find a friendlier chef, offering a more tailored private dining menu or cooking class! Veasna in the Kitchen doesn’t offer your average Cambodian food experience. Our private dining experiences are the perfect opportunity to treat your taste buds to the true flavours of Cambodia. Or, if you’d like a more ‘hands-on’ experience, we offer a Khmer cooking class and food tour where you can learn to prepare simple, healthy Khmer dishes that are most importantly, delicious! Veasna is a trained, professional chef with a passion for great food, and for sharing that food with visitors to Cambodia. This is your chance to have dinner cooked by a skilled Khmer chef, specifically tailored to meet your tastes. We are family friendly and very happy to cater to groups with children. Shall we set you a place at our dining table? Contact us with your preferred dates and any special requirements. We’ll book your cooking class & food tour, or private dining experience and get cracking on a menu you’ll love. Let the countdown begin! In the meantime, enjoy our videos and recipes.